Mud Eruption In Indonesia: Was Disaster Blamed On Drilling Activity Actually Caused By Quake? In 2006, the largest mud volcano on the planet was born when steam, water and mud began erupting on the Indonesian island of Java. At its height, it spewed 6.3 million cubic feet (180,000 cubic meters) of boiling mud per day, enough to submerge a football field under nearly 110 feet (34 m) of earth. The mud volcano still erupts with outbursts like a geyser. Oil and gas company Lapindo Brantas, which operated the well, claimed the eruption was due to natural causes. 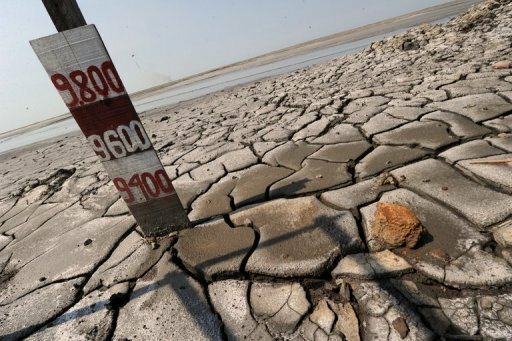 However, the Indonesian government, citing research from an international team of scientists, have instead held the company financially responsible, demanding it pay $420 million to cover retribution for the victims and aid efforts to stop the mud flow. Now, another group of researchers suggest the Lusi mud eruption may actually have had a natural cause, triggered by amplified seismic waves from the preceding earthquake. On May 24, 2011 over nine meters of sludge deposits pile up from the mud volcano that displaced nearly 50,000 people. Stephen Miller, a geodynamicist at the University of Bonn in Germany, and his colleagues analyzed seismic data from the site of the mud volcano. They concentrated on a curved layer of rock that capped the mud reservoir. Past research proposed that seismic waves from the preceding earthquake were too weak to trigger the mud eruption. However, computer simulations now suggest the curved layer of rock would serve as a lens to reflect, amplify and focus the quake's seismic waves, enough to liquefy the mud and set off the outburst. "Lusi is tectonics in action," Miller said. Not everyone agrees the eruption had natural causes, though. "I am 99 percent certain this was caused by drilling activity," said Richard Davies, a petroleum geologist at Durham University in England who did not take part in this study. "The explanation is remarkably simple and not an uncommon problem. [Andrea Th1] [Charles C2] "
When a borehole is drilled, mud is used, Davies explained. Drilling mud has several purposes, one of which is to provide enough pressure in the hole to prevent fluid that occurs naturally in the rock from coming into the well and climbing to the surface. The problem was, there was not enough mud in the hole in the early hours of May 28, 2006, "so underground fluid rushed into the hole, which led to a blowout, and the birth of the Lusi mud volcano," Davies asserted. Davies questioned why earlier, larger earthquakes did not trigger Lusi before 2006. "Our response to that is that the bigger earthquakes — meaning the 2004 magnitude-9.2 and 2005 magnitude-8.6 Sumatra earthquakes — were much more distant, about 2,000 kilometers [1,200 miles] away," Miller said. The seismic waves that reached Lusi were, therefore, much weaker. They were also a kind of wave that would interact with the curved rock layer at Lusi in ways that simulations revealed would prevent seismic energy from penetrating deep enough to reach the mud layer. 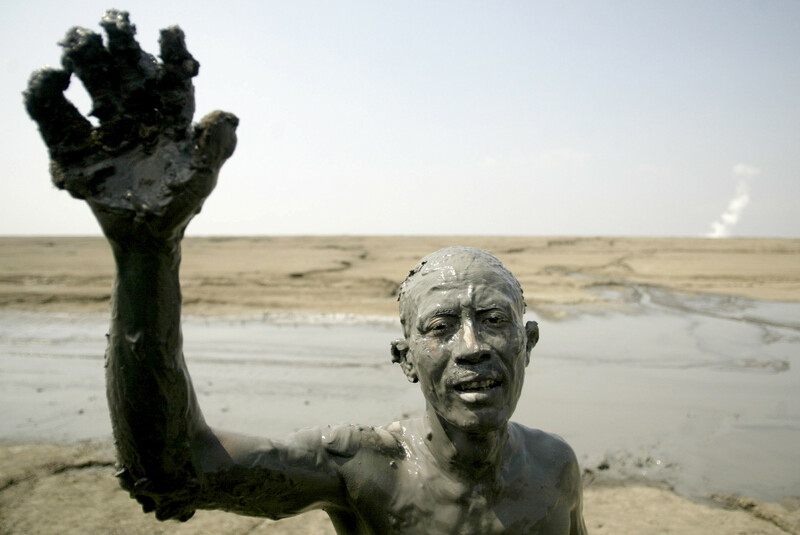 A victim of the Lapindo mud volcano takes part in a theatrical performance on a retaining dike in Sidoarjo, East Java on May 29, 2012. Although Miller and his colleagues think they have ruled out an artificial cause for the mud eruption, the company's drilling "was dangerous, in any case," he said. "Had the Yogyakarta earthquake not happened, they probably would have gotten away with it. But the earthquake happened, and their poorly designed borehole recorded the response of the mud layer to that earthquake." The findings are detailed their findings online July 21 in the journal Nature Geoscience.